Outside interventions to inner conflicts are part of daily news stream today. Where, when and how to intervene are the core of discussions. However from my point of view more weight should put to day after planning. In Balkans there is still frozen conflicts; Iraq, Afghanistan and many conflicts in Africa are most recent or still ongoing theatres, Syria and many more are coming soon on the table. Recent trend in international politics seems to be different separatist movements around the globe. Kosovo’s unilateral proclamation of independence from Serbia February 2008 played a key role in these developments, which already has been seen in Bolivia, South Ossetia and Abkhazia and probably many more waiting to spark. This trend has big potential to expand, because it is estimated that there is about five thousand ethnic groups on globe. The situation puts pressure to develop the effectiveness of future – if not even existing – civil crisis management operations. International crisis management has undergone a significant transformation in recent years. Its expansion in terms of tasks and timelines and the increasing number of actors involved have made effective coordination of activities an urgent priority. As a result the idea of a Comprehensive Approach has been adopted by many states and international organizations. However, recent efforts to implement it have shown mixed results. There is need to shift focus from tactical level – dashing from skirmish to skirmish trying to control a crisis – to strategic level with a more comprehensive and systemic approach to resolving the mess. If traditional peacekeeping focused on containment and reduction of military escalation, contemporary crisis management aims at a social, reach a comprehensive conflict resolution. This increasing set of tasks coincides with expanding time-lines of crisis management. In conceptual and practical terms crisis management spans today from the initial phase of conflict prevention, the actual crisis management encompassing humanitarian intervention, peace building and peacekeeping to post-conflict management. Whilst there is no commonly accepted definition for ‘Comprehensive Approach’, there is broad agreement that it implies pursuing an approach aimed at integrating the political, security, development, rule of law, human rights and humanitarian dimensions of international missions. It can be linked to different degrees of coherence for inter-agency relationships, namely Coherence, Cooperation, Collaboration & Coordination and Coexistence, where various actors may operate in a more or less comprehensive fashion, depending on their motivations, identities and organizational independence (Source:Comprehensive Approach-Challenges and opportunities in complex crisismanagement. Karsten Friis & Pia Jarmyr(eds); NUPI, 2008.). From my point of view I would rule out some military strategies from the context of this kind of crisis management problem. For example COIN strategey implemented in Afghanistan by U.S. is clear application of military strategy. It has some civil crisis management components which however act more like decoration and not as an essential element. The approach of needed study could be described as “bottom up” perspective, where the problem is defined from the point of view of field level experiences. It is important to note, that civil crisis management issue is not – or shouldn’t be – an extension of military peace-forcing operation; it is an integral part of international development aid programs in overall and in particular with peace-building activities. Perfect report does not mean that something positive development has happened on the field. The lesson learned from “bottom up” –approach could be the shift of focus from the issues made in right way to right issues, where vision, objective, strategy, implementation, feed back and especially commitment of beneficiary groups and project management have more important role in evaluation of operations than before. For developing a more effective approach to issue of civilian crisis management different aspects – such as organizational questions, reporting practice, or evaluation process – can be more or less highlighted. It is possible also to have focus on improvement of situation analysis, developing field experience feedback during missions or applying “project cycle management” practice in operation/mission planning procedure. One possible component could be applying Logical Framework Approach through the process. LogFrame is used in most EU projects, but individual donors have their preferences. LogFrame describes objectives, action lines, how individual projects are implementing the objective and how the success can be measured. There is also some flexibility according feed back during implementation. Special need at individual project and local level is also use there Participatory Planning methods so that all stakeholders can commit to actions. Applying these two practices can make new approach more vigorous. Comprehensive Approach is quite modern trend in international studies of peacekeeping operations or civil crisis management. Few seminar reports and researches are however available and they can help while connecting this study to wider theoretical context. Different mission reports can describe the viewpoint which the top officials are giving to the top policy makers. The most valuable source is field reports such as OSCE municipal profiles and analyses, CIMIC reports etc. because they are describing situation on the ground. The best source and research method would be participatory observation and interviews of fieldworkers. It is also possible to link study to concepts and instruments at mission level or to development of a comprehensive crisis management is a cyclical activity. Today there is a lot of information and feedback from different crisis management missions around the world; there is also experiece which methods are working on the ground and especially which are not. In my opinion there is urgent need to develop civilian crisis management by studying lessons learned to find best – and worst – practices from different missions. In Balkans there is still frozen conflicts; Iraq, Afghanistan and many conflicts in Africa are most recent or still ongoing theatres, Syria and many more are coming soon on the table. LogFrame approach by using participatory planning methods could show way towards quality peace. Since last Gaza War on December 2008 the peace process of Israeli-Palestine conflict is going backwards again. Hamas is firing its qassams to Israel and Israel Defence Force responds; Palestine authority is still missing, Israel government has more hardliners than before and International community is making their hypocritical useless statements without any new initiative or an outline for the future; even U.S.-Israeli relations have declined due Israeli building projects in East Jerusalem. A few years ago the people of Israel voted for a government that dismantled 10,000 Jewish homes in the hope for peace. The dismantlement led to disaster and instead of peace – Israeli civilians were targeted by Palestinian missiles. Last year the people of Israel voted for a government that wants to build homes rather than destroy them. The halt to settlement construction is a key demand by the Quartet of Mideast negotiators who are trying to restart negotiations between Israel and the Palestinians. Israel has agreed to curb settlement construction in the West Bank, but not in east Jerusalem, claiming the entire city as Israel’s eternal capital. Before discussing the settlements, Jerusalem and other final-status issues Palestinian Authority PA) should recognize Israel’s basic right to exist as the national home of the Jewish people. After that the PA could come to an agreement with Israel, and finally set the border lines. Once the borders are set, then Israel will not support building of settlements in the PA area. The announcement of a routine planning approval for 1,600 dwellings in the East Jerusalem settlement neighborhood of Ramat Shlomo precipitated a crisis in U.S. – Israel relations, especially when information of project came during U.S. VP Bidens visit in Israel. U.S. as well later EU condemned this latest dwelling project and for Palestine Authority settlements are regular excuse to skip negotiations. In a defiant speech last week to the leading pro-Israel lobby in the United States, Israel PM Netanyahu said Jewish neighbourhoods in East Jerusalem are “an integral and inextricable part of modern Jerusalem … The connection between the Jewish people and Jerusalem cannot be denied … The Jewish people were building Jerusalem 3,000 years ago, and the Jewish people are building Jerusalem today. Jerusalem is not a settlement. It is our capital”. There was a Jewish majority in Jerusalem since 1860. Jews lived all over Jerusalem, and fought courageously in the War of Independence in 1948 to maintain their hold on it but in the end lost many lives and the east part of the city. That is when it was divided for the first time. 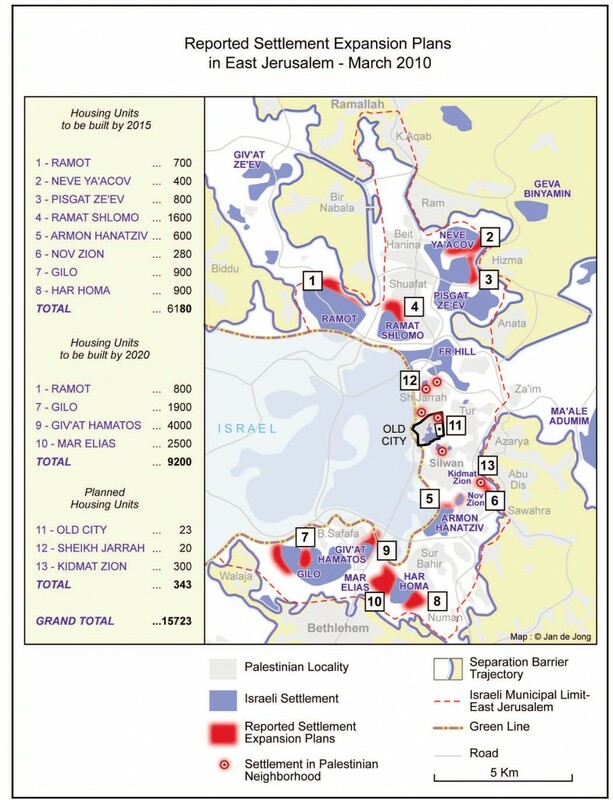 Israelis divide the Palestinians to five communities, as a means of control. There are the Israeli Palestinians, who are full Israeli citizens, enjoy the right to vote and have delegates in the Knesset. There are the East Jerusalemites who are not citizens, but have only resident permits and who are separated from the West Bank by the wall. There are the West Bank Palestinians who live in the five percent of the West Bank on the west side of the wall that Israel has, de facto, annexed to Israel, but who are also cut off from Jerusalem and forbidden to visit Israel. There are the West Bank Palestinians to the east of the wall. And there are the Palestinians in Gaza. 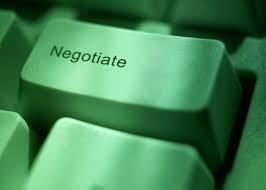 So far resolving the Palestinian-Israeli conflict has had two options on the top of agenda. The first is aim of two states for two peoples and the second is a bi-national Palestinian-Israeli state in which Palestinians and Israelis would have equal rights or a Palestinian-Israeli confederation, in which two states share joint political institutions – a one-sate option. The two-state solution is becoming more and more impossible by the day as Israel continues to build more and more settlements on Palestinian lands. There is hardly enough land to form a viable Palestinian state at this time as it is. But judging by the actions of the settlement movement and its supporters, the one-state solution seems to be the preferred solution. However the Israeli and Palestinian definitions of a two state solution are very different. Palestinian idea of a two-state solution may be supported but only if the border is the 1967 border and refugees are given the right of return, an Israeli viewpoint can be different with these two aspects. In Israel there is a group that believes that a bi-national state is inevitable because with Jewish and Palestinian communities so entangled in the West Bank, it will be almost impossible to divide them. However same time there is some base to claim that there is too much animosity and dehumanization among the Palestinian population that would make a peaceful co-existence between them and Israelis virtually impossible. If one would like to take a cynical point of view so a de facto one state is the current reality on the ground. Israel rules all mandatory Palestine from Jordan to the Mediterranean. There is one regime based on ethnicity and security and Israeli control. Progress towards two-state solution seems unlikely. If some ethnic groups hate each other and when both can base their views and claims to selected parts of hundreds or thousands of years so basically there only two peaceful solutions: to train tolerance for generations developing same time living conditions or separate the groups by ethnic lines. After WWII Germans moved e.g. from Poland inside new borders. Finland settled some 10 % of its population from territories occupied by the Soviet Union, which from its side transferred new population to new regions. Israel itself is mainly settled by immigrants and e.g. in last twenty years over half a million people with some Jewish origin has come from ex-Soviet Union. In smaller scale more or less forced population transfers have been emptying Jewish colonies in Gaza. To be successful these kind of population transfers must be supported by effective re-settlement programmes. Within less than a century, between 7 million and 10 million Balkan refugees have been uprooted from their homes. After WW2, between 12-16 million Germans were forced out of Sudentenland (Czechoslovakia), Romania, Hungary and Poland into Germany; many of them had not supported the Nazis during the war. 14 million people were exchanged between Hindu India and Moslem Pakistan. In 1994, 540,000 Moslems fled Christian Armenia for Azerbaijan and 360,000 Armenian Christians fled Azerbaijan for Armenia. As Israel did with the Jewish refugees from Arab countries, Armenia absorbed the Christian refugees, while — just like the Arab refugees from Israel — the Moslem refugees languish in Azerbaijani refugee camps. From the late ’80s on, 75,000 non-Moslem blacks from Mauritania were exiled to Senegal and Mali, while 75,000 Arabs fled to Mauritania. Ethnic conflicts in the Sudan continue — between Muslim Arabs and black animists in the South; and between Muslim Arabs and black Muslims in Darfur. 3 t0 4 million black farmers of Darfur have fled Arab-dominated Khartoum, where some 200,000 to 400,000 black Muslims have already been killed. Cyprus has been split between Christian Greeks and Moslem Turks; this included a population exchange, where 200,000 Greeks and 50,000 Turks were shifted. Even before Israel became a state and increasingly after that, more than 800,000 Jews were forced to flee the Arab countries, where many of them had lived way before the Arabs Conquest; most of them came to Israel. When it became a state in 1948, Arabs left to avoid the coming war, fled in fear incited by their own press or were forced by their leaders to leave Israel. The Arabs claim 650,000-750,000 up to a million refugees, while the UN Acting Mediator in October, 1948 set it at 472,000, of which 360,000 required aid (UNRWA is now supporting 4.5 million of their “descendants”.) Of all the refugees, only these Arabs have demanded the right of return. I wonder why there is not more discussion about a “three-state” approach, where Gaza is returned to Egyptian control and the West Bank in some configuration reverts to Jordanian sovereignty. From my point of view this solution could also be more economically sustainable than other options. It could be a bit further developed by making a buffer zone between Israel and hard-liners in Gaza. From my point of view the best way to do this is to relocate population from Gaza some 50-100 km SW to Sinai. There is possible to build new infrastructure instead again repairing existing one. With good planning and implementing economic-social programmes backed with sufficient international Aid money it is possible also to create more sustainable economy than today’s Gaza. More in “The Three-State Option could solve Gaza Conflict”. The failure of U.S. in promoting the peace process between Israel and the Palestinians may be related to fact that again the plans are made on Washington’s drawing board without understanding regional circumstances and mentality in the Middle East; the growing gap between reality and idealistic day-to-day politics is now demonstrated not only as strain in the U.S. Israel relationship but also as declining U.S. credibility among Palestinians. The same – as U.S. foreign policy – can be said about EU’s foreign policy (if one can found that some where). EU does not seems to have any vision nor strategy and initiatives for the Israeli-Palestinian peace process. Modest attempts to use carrots (squandering aid to capacity building in West bank and Gaza) and no use of sticks (e.g. embargo) reduce EU’s foreign policy activities to empty statements (“The European Union has condemned all the settlement activities”). From my viewpoint the basic truth of the matter still stands: Israel is the only nation in the Middle East that holds free elections, enables freedom of speech and cherishes similar values to those of average European and American people. This said I must add that there is not only a conflict between Israelis and Palestinians, but a battle between those who believe in a mixed, tolerant and non-racial society, and the forces of ultra-nationalism in both Israel and Palestine.